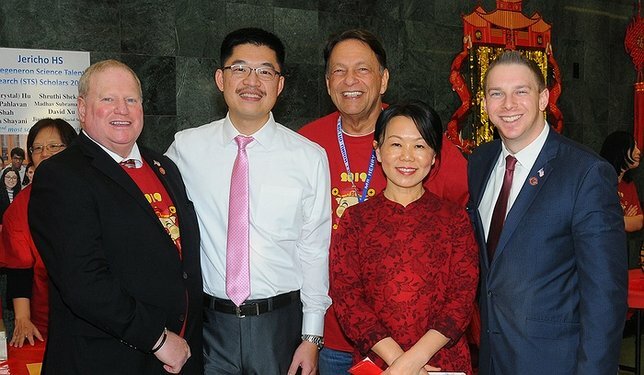 Legislators Drucker and Lafazan recently heralded the arrival of the Lunar New Year with the Chinese Association of Jericho. Jericho, NY - February 8, 2019 - Nassau County Legislators Arnold W. Drucker (D - Plainview) and Joshua Lafazan (Woodbury) heralded the arrival of the Lunar New Year with the Chinese Association of Jericho on Saturday, Feb. 2. The not-for-profit organization hosted the celebration at Jericho High School, where they rang in the Year of the Pig with a program of traditional and cultural performances. Subject: LongIsland.com - Your Name sent you Article details of "Legislators Drucker and Lafazan Celebrate Lunar New Year With Chinese Association of Jericho"